In advance of Veterans Day 2006, the Department of Veteran Affairs (VA) began encouraging all military veterans to wear their medals and decorations during Veterans Day, Memorial Day, Independence Day, and other patriotic holidays as well as formal occasions such as a parade honoring the military, retirement ceremonies, funerals, or weddings. The Stolen Valor Act of 2005 makes it a federal crime to wear a medal or decoration that you're not entitled to. Therefore, you should double-check to make sure that you're only wearing the decorations that you've earned). You can do this by requesting a copy of your DD Form 214 from the National Military Personnel Records Center in St. Louis. If you've lost your decorations or never received them, veterans may be entitled to a one-time free replacement of medals and decorations. Active duty personnel, reserve, and military retirees can purchase replacement decorations on base, at the Exchange Clothing Sales Stores. 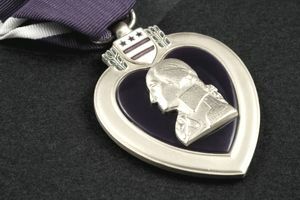 For other veterans, pawn shops, and military surplus stores often carry decoration replacements. In many cases, you can even order medals and ribbons online. There is no federal law that describes the method of wearing military medals and decorations with civilian clothes. However, each of the military services has uniform regulations which cover this question. Army Regulation 670-1, paragraph 30-6, says that former members of the Army (including active duty, reserves, or Army National Guard), may wear medals on "appropriate" civilian clothing on Veteran’s Day, Memorial Day, and Armed Forces Day, as well as at "formal occasions of ceremony and social functions of a military nature." Appropriate civilian clothes include clothes designed for veteran and patriotic organizations, such as VFW or American Legion uniforms. You can wear either the full-size or miniature-size medals. You should place the medals and decorations in approximately the same location and in the same manner as for the Army uniform, so they look similar to medals worn on the Army uniform. Air Force Instruction 36-2903, paragraph 4-4 says that honorably discharged and retired Air Force members may wear full-size or miniature medals on civilian suits on appropriate occasions such as Memorial Day and Armed Forces Day. Female members may wear full-size or miniature medals on equivalent dress. As with the Army, medals should be placed in the approximate same location and in the manner they are placed on the Air Force Uniform. The Navy Uniform Regulations, Chapter 6, paragraph 61002, subparagraph 7 includes the requirements for wearing Navy decorations on civilian clothes. The regulation authorizes the wear of miniature medals and Miniature Breast Insignia on civilian evening dress (white tie) or civilian dinner dress (black tie) in the same manner as for dinner dress jackets. For non-dress-up affairs, you may wear miniature replicas of ribbons made in the form of lapel buttons, or ribbons made in rosette form, on the left lapel of civilian clothes. You may also wear miniature distinguished marksmanship and pistol shot badges as a lapel pin or as part of a tie clasp on civilian clothing. The Marine Corps Uniform Regulation, MCO P1020.34G, says that decorations, medals, appropriate ribbon bars, or lapel buttons may be worn on civilian clothes at the individual’s discretion. Individuals should ensure that the occasion and the manner of wearing will not reflect discredit on the award. Miniature medals may be worn with civilian evening dress. For non-evening dress, miniature replicas of ribbons made in the form of enameled lapel buttons, or ribbons made in rosette form, may be worn on the left lapel of civilian clothes. The Coast Guard Uniform Regulation, Table 3.G.1, allows the wear of miniature medals with civilian evening dress (white tie). You should wear them in the same manner as prescribed for Formal Dress uniform, and with civilian dinner dress (black tie) in the same manner as prescribed for Dinner Dress uniforms. Miniature ribbon replicas may be worn the left lapel of other civilian clothes.